During my week in Wales, I paid a visit to the small town of Narberth. We’d driven through it on the way back from Tenby, and spotted a couple of interesting looking shops. After a walk along the beautiful coast path, we drove back inland and parked up in search of lunch. Burgers, chips and a couple of litres of lime and soda later and we were refuelled and ready to explore. 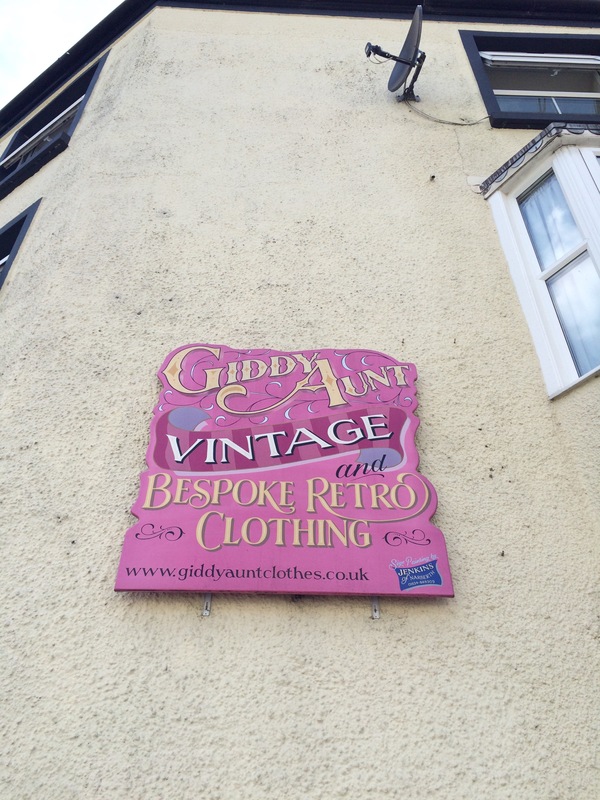 The first stop, just around the corner from lunch was Giddy Aunt Vintage. I was even more intrigued/bemused by the tearoom sign displayed in the doorway outside – an alternative life, perhaps? Inside Giddy Aunt’s I couldn’t help but smile. There was a rack crammed with vintage patterns, most in great condition with prices that reflected it, around £8. There was also a basket with some more thumbed patterns which I think were £3 each. In addition to patterns, the lady behind the counter was beavering away at her sewing machine. It was clear she designed and made garments to order, using predominantly Alexander Henry fabric. The fabric was also available to buy off the roll. There was a range of garments for sale, new and vintage, and a fairly eclectic collection of items filling the rest of the shop, including old maps and some very sweet bird buttons that I will forever regret leaving behind. 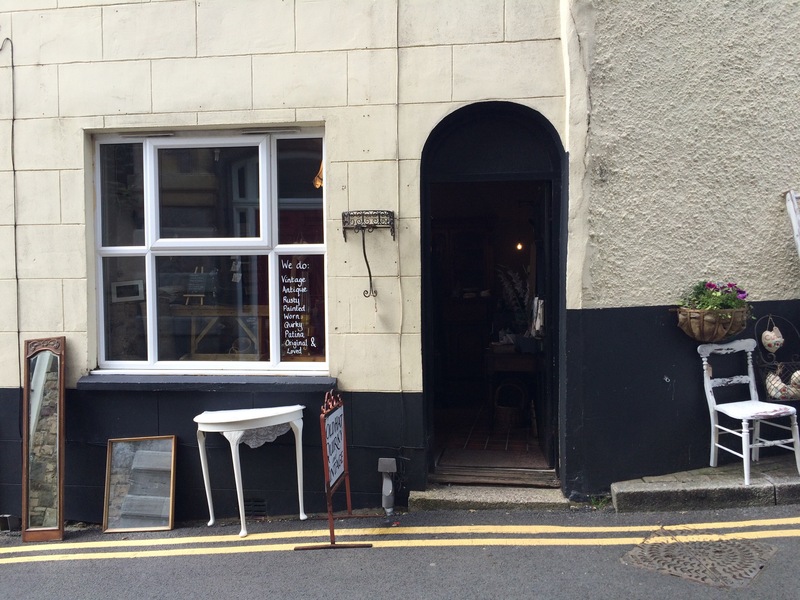 Next, just next door and with their wares spilling out on to the pavement, was another vintage/antiques shop. As this one looked a bit more classy, and someone has to stay outside with the dogs, I contented myself with just peering through the window. There were a few charity shops which are always worth exploring. 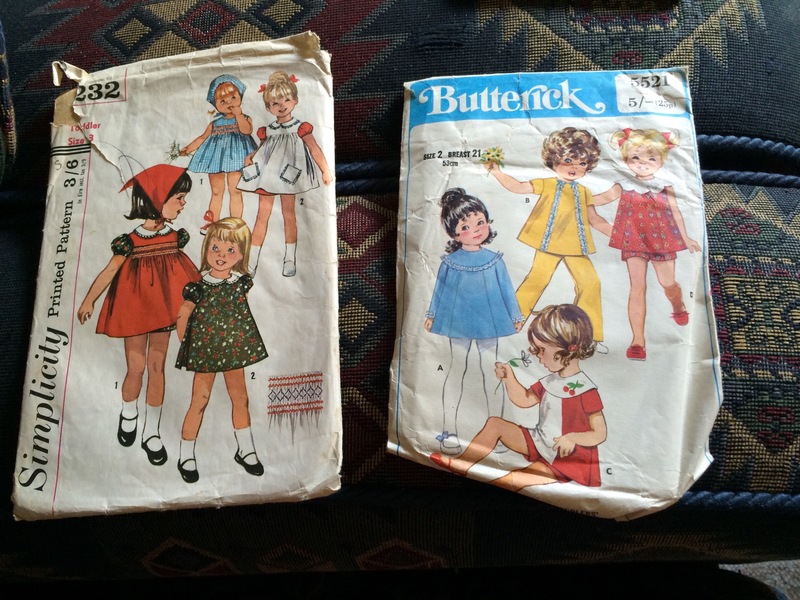 The one I went into had two baskets of vintage sewing patterns – seriously, I have never visited a town that had so many vintage pattern outlets – priced at either £2 each for the more intact or £1 for the less. I was a bit overwhelmed and overheated, so had a rifle through then left. After this, we wandered though town, basked in the hot sun and felt ready to return to the cottage and rehydrate properly. 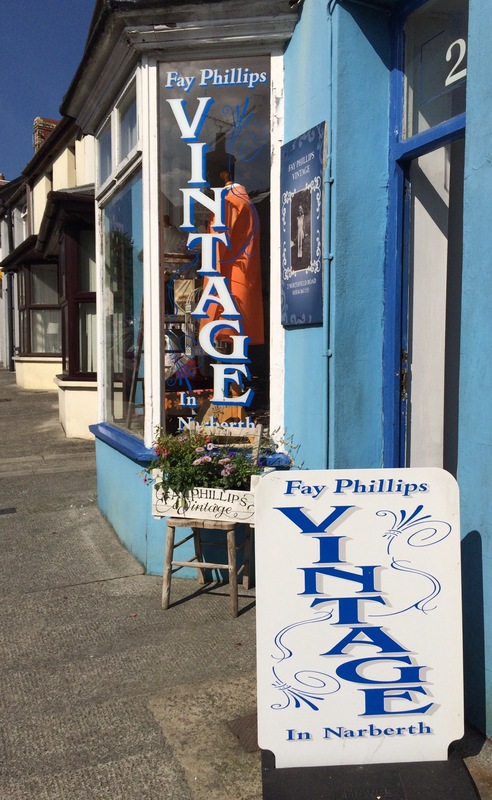 Before going back to the car, I paused at Fay Phillips Vintage – the store I had spotted on my first drive through town. I wasn’t really surprised to discover MORE SEWING PATTERNS, as well as kitchen ware, garments, and all manner of vintage items, as well as very friendly shop keepers. Again, I left with nothing. Once back in the car, I couldn’t help but feel regretful that I hadn’t bought anything from any of the wonderful shops here, so we called back down to the charity shop where I chose 5 patterns and was charged £6. Yes, I know, strictly speaking I didn’t need more vintage patterns, after my Cardigan haul, and I don’t even make clothes for children, but they are very sweet, stylish and sometimes it’s simply too hard to resist. And it was for charity. Mostly. You and your vintage pattern finds! 🙂 Fab! Particularly liking the dresses top right, the designs don’t actually look too dated at all, love the middle style. 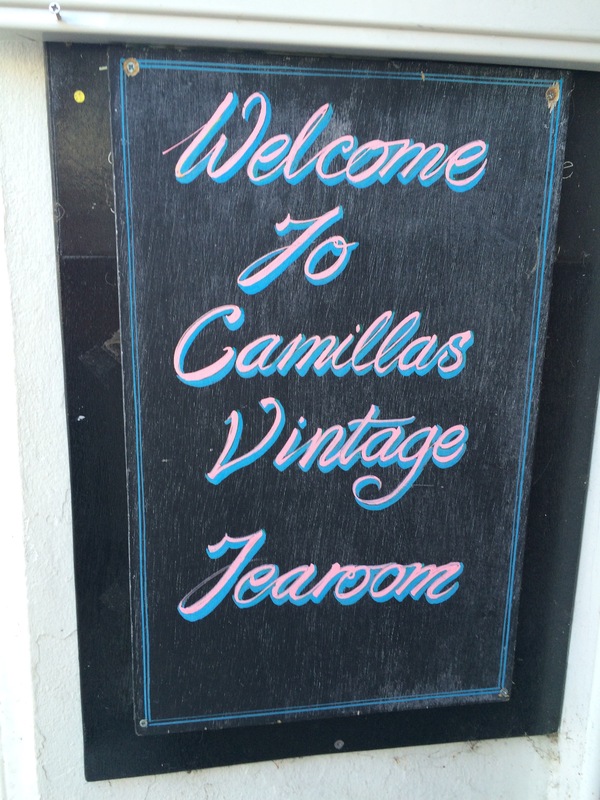 Lovely tale – I dream about erecting a sign saying “Sheila’s Vintage Tearooms”……. This sounds like the perfect place to visit! 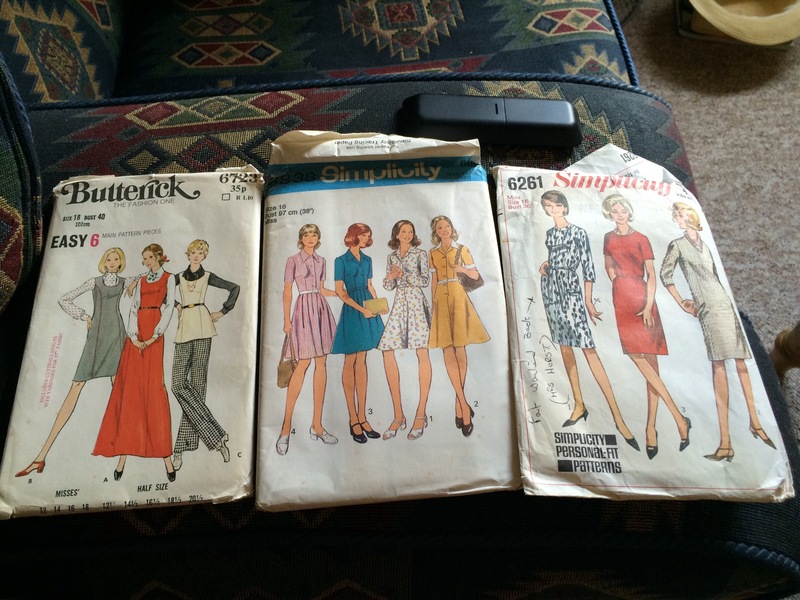 I love the vintage patterns – you can never have too many! It was a lovely place to visit. I know – But I think I need to start exercising more discretion – I bought a couple more yesterday! I really love that little girl’s dress with the peter pan collar! Yeah just keep telling yourself it’s for charity!! Great pattern finds! Why do I never find anywhere that sells any?! Narbeth looks lovely too.